Challenging spring conditions, warm weather and a very early harvest produced rich, sumptuous Pinot Noirs, Zinfandels and Syrahs that offer a compelling interplay of dense fruit and vibrant, pulsating acidity. The best 2015s are exotic, viscerally thrilling wines endowed with phenomenal purity, depth and intensity. 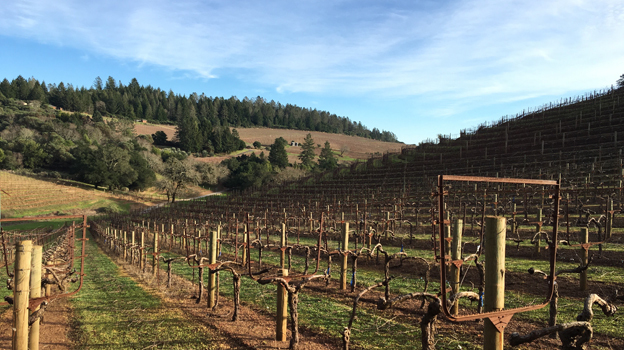 This article covers new releases from Sonoma and a number of neighboring appellations, including Anderson Valley and Mendocino. Napa Valley’s grip on the collective consciousness is so strong that all too often assessments on the overall quality and style of vintages in Napa Valley are taken as a proxy for other regions, or, in some cases, all of Northern California. Let me be clear: Weather and conditions in Napa Valley - and their impact on wine quality - are not all relevant to Sonoma. For starters, Sonoma County is approximately three times larger than Napa Valley and is home to a dizzying array of microclimates, ranging from appellations such as Moon Mountain and Knights Valley that border Napa Valley, to the Russian River, Dry Creek and the true Sonoma Coast, among others. Weather is also generally milder than in Napa Valley. Sonoma excels with a wide range of grape varieties, both red and white, while Napa Valley is of course mostly planted to Bordeaux varieties. The late season heat spikes that were such an issue in Napa Valley were far less problematic in Sonoma. In Napa Valley weather stations reported 20 or so days of temperatures above 100 degrees Fahrenheit. By comparison, in Sonoma some regions saw no heat spikes to speak of, where others had 5 or 6 days in which temperatures reached 100 degrees. Whereas temperatures in Napa Valley can easily reach 100 degrees and stay there for hours, in Sonoma the period of time temperatures remain elevated is usually much, much shorter. In the end, though, little of that matters because much of the fruit in Sonoma was off the vine entirely before temperatures soared. In those cases, heat spikes were, of course, a total non-factor. Two thousand fifteen was the fourth year of drought cycle that was broken emphatically by heavy rains this past winter. The growing season got off to a shockingly early start, ahead of both 2013 and 2014. Weather during flowering was highly unstable. Shatter was prevalent in many vineyards. A number of coastal sites, where conditions are especially challenging even in normal years, were hammered. Some vineyards essentially did not produce fruit at all. In most areas, production is down between 30-50%. Pinot Noir was most adversely affected, while Syrah and Chardonnay, which tend to flower later, benefitted from better weather and generally more normal yields. Low, sometimes unnaturally low, yields give the 2015s remarkably dense, plush fruit. At the same time, the wines have generally retained extraordinary freshness and aromatic presence. Of course there are a few disappointments. That is to be expected in a large, sprawling region like Sonoma and its environs. Some wines are too big and concentrated for their frames. Others are overextracted, which is always a risk when yields are excessively low. Still, even a few underachievers can’t detract from the extraordinary quality and profound beauty of the finest in this vintage. Two thousand fifteen is especially strong for Pinot Noir. The most successful 2015 Pinots are rapturous, viscerally thrilling wines. Sadly, as mentioned above, yields are down sharply. Similarly, the best Zinfandel and Zinfandel-based wines are fresh, vibrant and wonderfully delineated. Yields for Zinfandel vary widely, depending on when specific vineyards went through flowering. The 2015 Syrahs I have tasted so far are exciting and voluptuous, but also impeccable in their sense of proportion. Chardonnay, on the other hand, is more uneven. The best examples are rich and unctuous, but some wines appear dulled by the concentration of the vintage. I also tasted quite a few bottled 2014s that are current releases. The wines I tasted this year reinforce my initial view that in general 2014 is a terrific vintage for Pinot Noir, Syrah and Zinfandel. At the very top, the best 2014s are absolutely stunning. The Chardonnays are variable, with many wines that are diffuse and not as precise as they can be. These are some of the highlights of the wines I tasted during my round of tastings this year. Apologies in advance, it’s a long list. The 2015 Pinots – Freakishly low yields resulted in dramatic, voluptuous wines of the highest level that have also maintained striking freshness and bright acidity. Carlisle – The wines used to be black, now they are red. And vineyard signatures have never been better articulated than they are today. 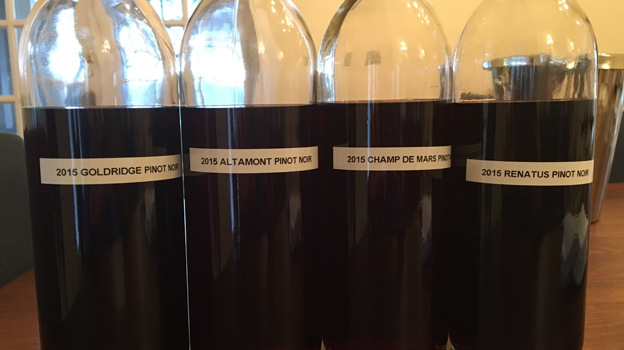 Ceritas – John Raytek crushed the 2014 Pinots. You want these wines. I want these wines. DuMol – Andy Smith is more energized than I have ever seen him now that he is focused exclusively on DuMol. These new releases are absolutely brilliant. Ferren – Matt Courtney has an uncanny talent for finding sites that fit his stylistic preferences like a glove. The Chardonnays in particular are exceptional. Once and Future – Joel Peterson is the visionary of Zinfandel in California. Peterson’s wines from his newest project are impressive. Paul Hobbs’ new Pinot Noir Fraenkle-Cheshier – From a cool site in the Sebastopol Hills, the Fraenkle-Cheshier could very well turn out to be Hobbs’ most distinctive Pinot. Littorai – Ted Lemon has been making pedigreed wines for so long it is easy to take him for granted. Don’t. The 2015 Chardonnays in particular are superb. Martinelli – The wines seem a bit fresher and more energetic than in the past, yet still have plenty of their signature richness. In a word: Brilliant. 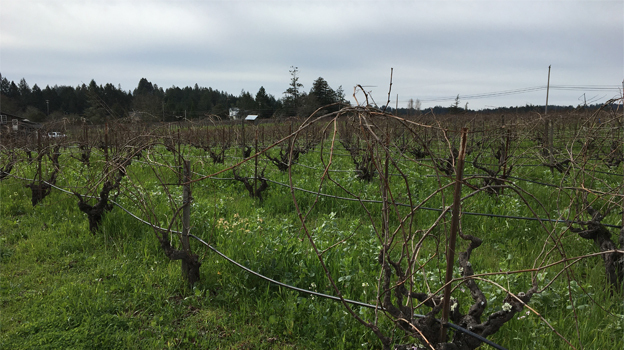 Occidental – Steve Kistler’s coastal Pinots are utterly breathtaking. Peay – This year’s release are the very best wines I have ever tasted from the Peay family. Rivers- Marie – Brilliant Chardonnays and Pinots from Thomas Brown and Genevieve Welsh. I can only wonder what the Cabernets might be like if they were made with the same aesthetic. Rochioli – Tom Rochioli's 2015 Chardonnays are worthy of a special mention, as they are terrific. Russian River Zinfandels – Striking, perfumed Zinfandel and Zinfandel-based wines in 2015. Verité – Finally a bit of balance. And the wines are stunning. (Reviewed in Part Two of this article). 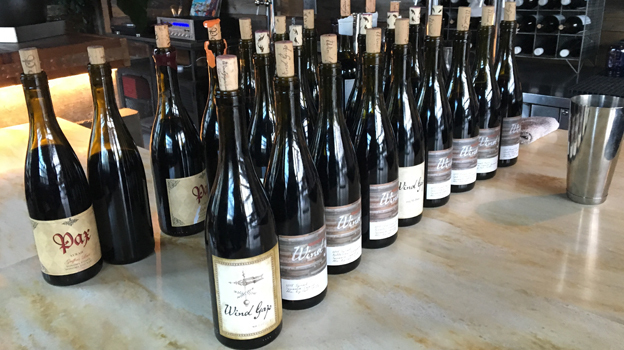 Walter Hansel – The 2015 Pinots might be the very best wines I have tasted here. The wines embody the essence of Russian River Pinot Noir. Pricing remains exceedingly fair for what is in the bottle. Changing Vineyard Names – The habit of new owners renaming vineyards is an obnoxious, ego-driven practice that also destroys the brand equity the previous owner and fruit customers, where applicable, have built over time. I would like to see an official land registry whereby vineyard names are recorded permanently as of an agreed upon date. When vineyard names change, Sonoma loses important pieces of history, heritage and pedigree. Those are the very elements that, over time, allow for a piece of land to become revered and for its wines to achieve icon status. What a shame. Well, another word comes to mind, but it is unfit to print. Massive Rain and Flooding – Weather conditions have been dramatic so far this year. The effects of heavy flooding, landslides and closed roads will likely be felt for some time. Yields – Production is down sharply in 2015, which means many wines will be hard to find. Platt – Virtually all of the historic customers of this fruit have left the vineyard during its first year under new ownership. It is sad to see so many track records interrupted. On the other hand, it will be interesting to see what newly arrived winemakers do with this fruit. Judgment reserved for the time being. The big get bigger, and the small get smaller – It is no secret that big groups continue to gobble up vineyard and wineries to achieve greater scale and the kind of powerful vertical integration that can result when ownership of distribution is part of the equation. At the other end of the spectrum, smaller estates realize that they will never be able to compete with the big players, and that any attempt to do so would require a huge investment of time and money, with an uncertain payoff. I am seeing more and more artisan estates quietly trim their range and focus on making a smaller amount of wine that can be sold with minimal marketing effort of both time and money. 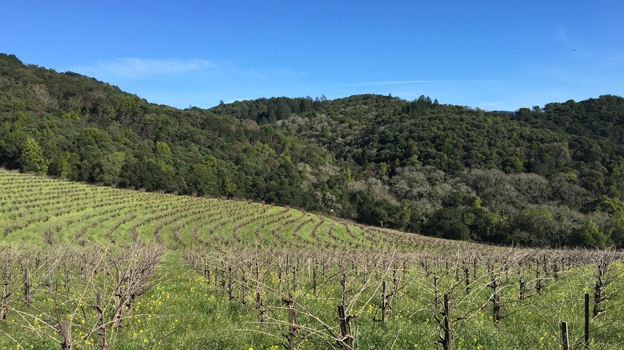 Sonoma’s recently created Moon Mountain AVA occupies a strip of land in the Mayacamas Mountains that borders Napa Valley’s Mt. Veeder AVA. Both appellations are home to numerous first class vineyards. 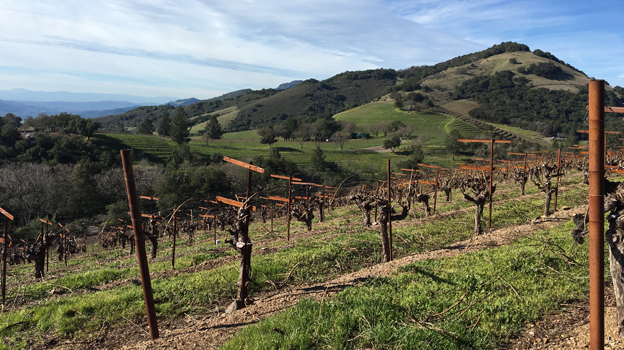 Montecillo, Fredericks, Monte Rosso, Kamen and Kistler are among the many top sites on the Moon Mountain side, while Mayacamas, O’Shaughnessy, Hess, Pym-Rae and the Jackson properties are some of the better-known vineyards on the Mt. Veeder side. 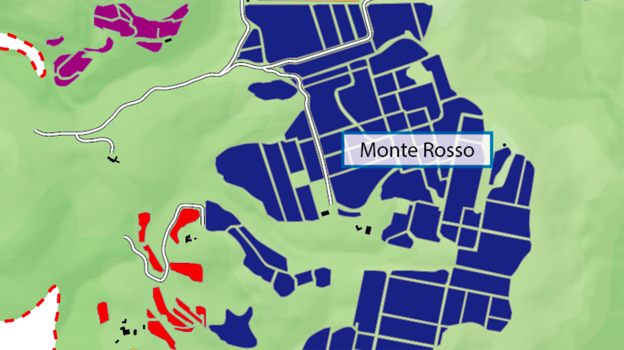 For the first time ever, wine lovers will be able to explore the spatial relationships between these vineyards and their respective appellations in our forthcoming map of the vineyards of Mt. Veeder and Moon Mountain, which will be released later this year. It is our most ambitious map to date. I tasted most of these wines during a visit to Sonoma in January 2017, followed by further tastings in my office in New York. While I would like to report my tastings in Sonoma took place under ideal weather conditions, the exact opposite is true. 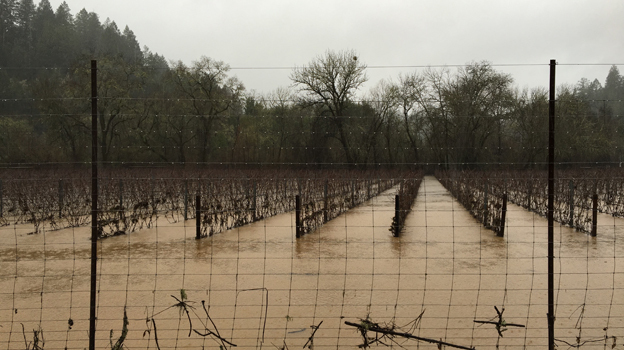 Cold weather, heavy flooding, landslides and a host of other natural disasters were pretty much the norm throughout my time in Sonoma. Even so, the wines were absolutely brilliant. The second installment to this article will be published in approximately two weeks. Freeman Trail Marker Wine Co.